Company: LevelUp Holding Co, Inc.
LittleBird is a mobile app and software ecosystem that delivers home automation technology to multifamily residents along with a variety of community and neighborhood features. 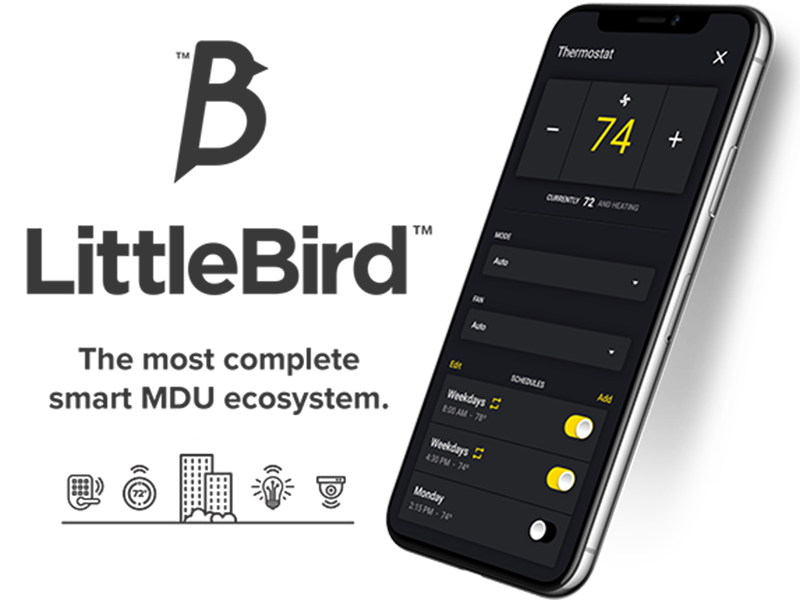 With our easy-to use app, residents can control their unit’s lights, locks, and thermostat, as well as receive notifications from motion detectors, door contacts, and water sensors. Home automation is becoming an in-demand feature for apartment communities, but LittleBird doesn’t stop there. We take smart technology and expand it to include services that streamline administrative and resident-retention tasks, while increasing efficiency. Residents can receive messages and event updates from management right on their phone, allowing for significantly more engaging tenant communications compared to flyers and emails. 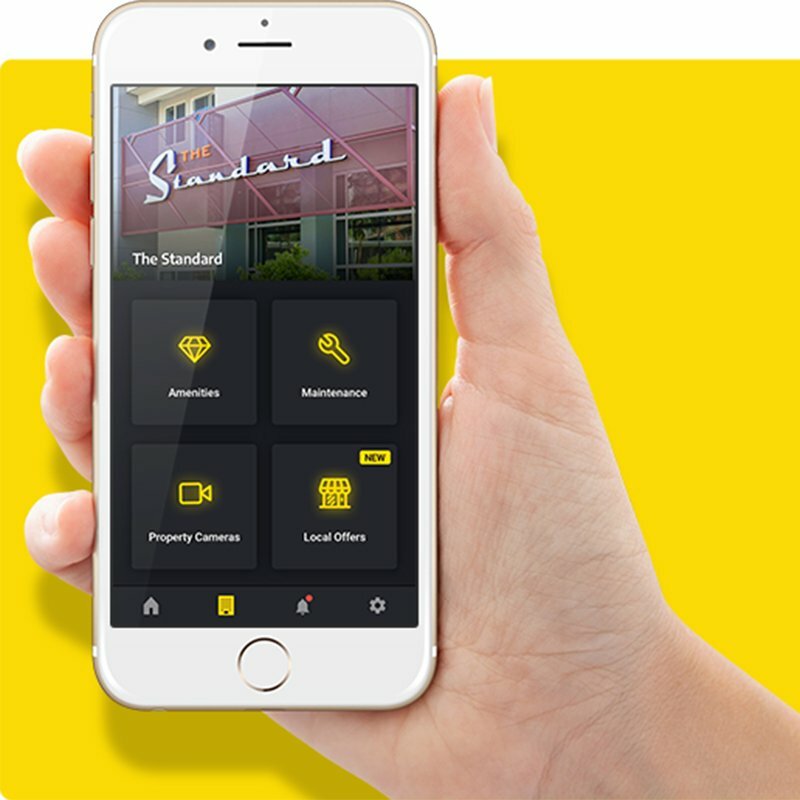 LittleBird helps establish a sense of place and belonging for residents by connecting them to their local neighborhood with special offers and concierge services to get to know local merchants. We integrate with existing property resources, such as the camera/AV system and other software management tools. 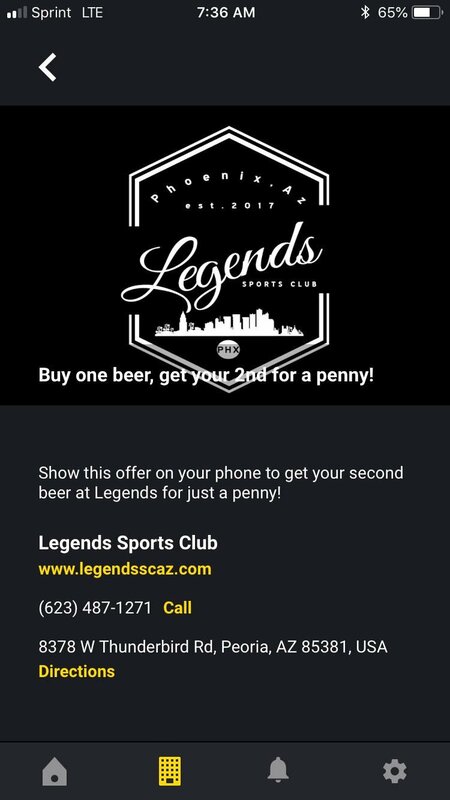 All this to deliver innovative amenities— like the real-time ability to schedule a workout outside of peak gym hours, and much more— at an affordable price. 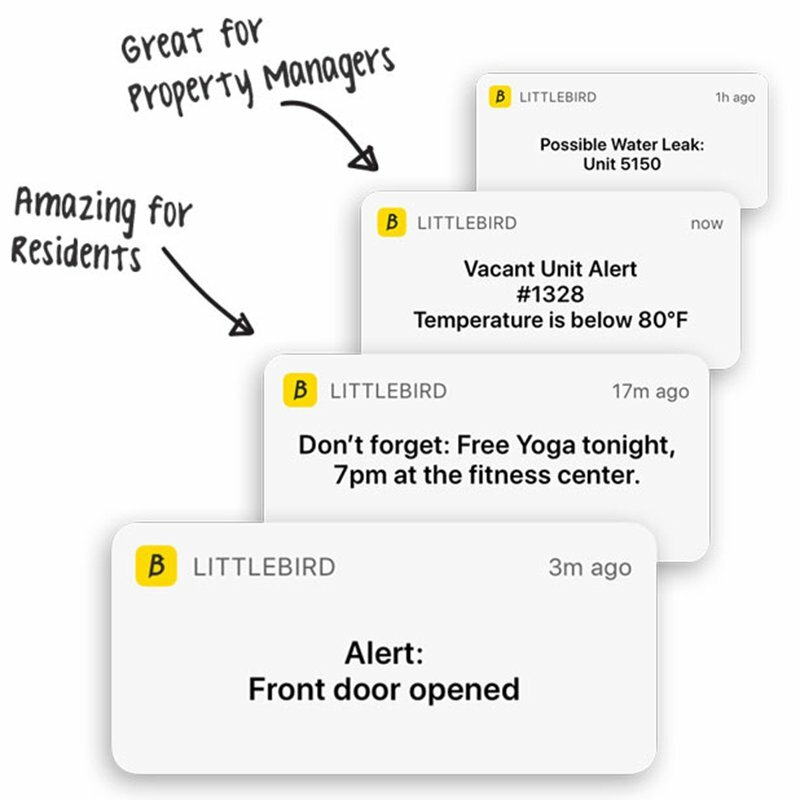 LittleBird is an “easy amenity” for builders, owners, and managers to add to their property in an increasingly competitive technology and feature-driven market. LittleBird automates many of the functions that take valuable time away from owners and property managers, allowing them more time to focus on other critical issues. We’ve made it surprisingly cost-effective to implement, especially in the clubhouse and common areas. LittleBird immediately makes an impression on prospective residents, showing them that this is a property that’s up-to-date with current trends and really looking to meet their needs. It checks goals for smart apartment technology, access control, resident experience, and more off of your to-do list. For contractors, it can even provide building and utility analytics to help plan for and manage property issues. There’s nothing else like it. Our platform has been built with the perspective that comes from more than three decades in the multifamily and low voltage contracting industry. We understand the needs of owners, property managers and residents, and we’re building the perfect app and platform the support them all. Modern residents are looking for more than walls, a window, and a door. They want a richer experience, both inside the unit and out. LittleBird makes residents feel connected with their unit, community, and neighborhood in a truly hands-on way, using the device they always have with them and that they’re already using throughout the day. Not only do they get the peace of mind and convenience of smart apartment technology, but also a next-level local network and sense of place. With everything from green living features to personalized connections with local businesses, LittleBird is the most convenient way to quickly turn a house into a home.